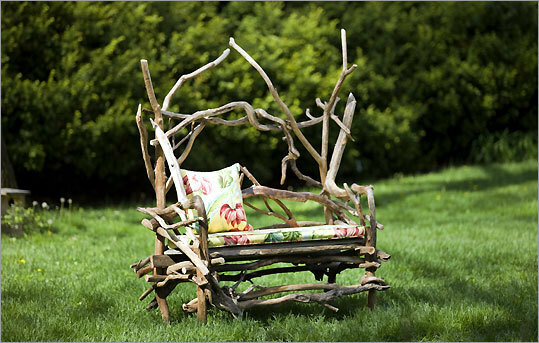 How one artist turns an invasive vine into whimsical, green furniture. I am saving that tree,” says the trained biologist who also had a career as a nurse. It can take hours to find the right combinations of vines. She drags her finds to her old Dodge Durango. Reilly, who is 51, came to furniture making recently, and she describes her first, self-taught endeavors as failures. “They became firewood,” she reports. After an apprenticeship under Concord artist Jack DeMuth that she used to hone carpentry skills, she began experimenting with bittersweet. It is now central to her work. Reilly labors in her cellar most of the year and in her garage and out of doors in warmer months. Her home functions as her showroom, too; most of her work is designed for indoor use ($300 to $500 for lamps, $500 to $2,500 for tables) but some pieces are three-season, and she makes outdoor arbors ($1,000 to $3,000) and furniture to order.